Everything we do in life is a series of actions. Just to get to work I need to wake up, eat something, brush my teeth and drive to work. Or when the data is sent to the server your code has to validate the user input, it has to create a new object with the attributes, this new data has to be saved and a response data needs to be generated in JSON format if your request happens to be an Ajax request. When I write code for a series of tasks I start out with a "coordinator" object that has several private methods internally. The main and public method orchestrates the calls for the private methods. The tests around this object start out pretty nice, but as the complexity grows I need to stub more and more external objects. The complexity of the tests are soon becoming indicators of the worsening design and I need to start pulling out objects before the whole thing turns into an iceberg class. All my examples are in CoffeeScript. I use CS for brevity and for its concise format. Please check out this gist to see the specs. I used mocha to test-drive my code. It's all nice and sweet. Except we have that nasty "if statement" in the middle of the GoesToThePark#toEnjoyTheWeather method. Whenever I see a conditional block in the middle of a function call I immediately assume the violation of the Single Responsibility Principle. I tolerate guard conditions in methods, but that "if statement" must die. 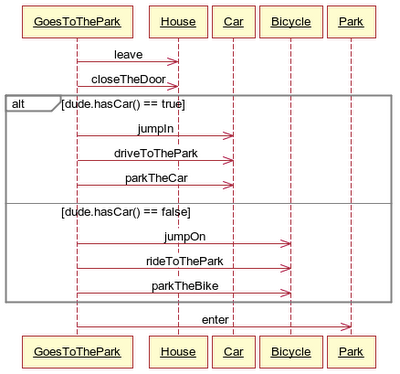 I remembered in my early Java and C# days reading about the Chain of Responsibility design pattern. Every little command object is linked together with a linked list, the first one is called from the "coordinator" object and they each check if there is anything to do with the arguments. If there is, the action is executed and at the end of the method call the next command in the chain is being called. I found them especially helpful in workflows similar to the example described above. The coordinator object only knows about the action objects and its only responsibility is to call the one and only method on them in order. There is no conditional in the method any more, the actions are smart enough to figure out if they have to deal with the object in the context or not. Only the DrivesToThePark and RidesTheBikeToThePark protects itself with guard conditions, their execution is dependent on the fact of the Dude having a car or not. But those are simple return statements at the very beginning of the method call. You can review the entire file in this gist. The beauty of this code lies in the toEnjoyTheWeather() method. It is simple and now it's super easy to test. In fact, I worked on a Ruby code where the coordinator object called a dozen different objects through it's private methods. Tests were brittle, I had to stare at the code to figure out why something was failing after a simple change. My specs were a clear indication that the code needed serious refactoring. I changed my code using the pattern above and I eliminated all the private methods - they became simple action objects - and testing became much simpler. I leave you the exercise of writing the specs with stubs for the example prior to using the action objects. Listen to your tests, they tell you the story (or the quality) of your code. Don't be afraid of creating tiny classes or objects with only 6-10 lines of code. They are super easy to test and I consider them the building blocks of reliable and maintainable software. Big thanks to websequencediagrams.com for their tool I used to create the sequence diagram in this blog post. Nice post. Cool Web Sequence diagram tools. I was encouraged to take a crack at coding up an implementation. Bike and Car use the same method names (use,travelToPark,Park). A vehicle variable is used to store Bike or Car depending on whether Dude.hasCar, and use,travelToPark,Park methods are called on vehicle. Let me know what you think: http://jsbin.com/anakul/8. It's a nice alternative to what I described. And it works when both the Bike and the Car has the same methods. What do you do when the Car has an extra step called "turnOnTheEngine()"? Also, I made a gist from your code so other people can see easily what you were trying to do: https://gist.github.com/2367479. @oil painting: Sorry, I had to remove your comment. Please refrain from putting advertisements in the comment on my blog. Thanks!